Citation Information: J Clin Invest. 2002;110(8):1191-1200. https://doi.org/10.1172/JCI16309. Deletion of mouse Cyp8b1. (a) Reaction catalyzed by CYP8B1, a microsomal cytochrome P450. 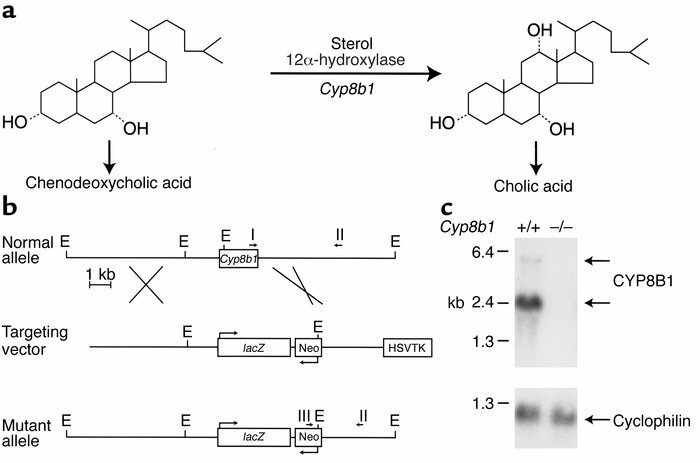 The enzyme is quite promiscuous with respect to sterol substrate and acts on several 7α-hydroxylated intermediates of the bile acid pathways, only one of which is depicted here. (b) Structures of normal Cyp8b1, the targeting vector used to replace the gene’s coding sequence with that of E. coli β-galactosidase (lacZ), and the expected mutant allele following homologous recombination in embryonic stem cells. The diagnostic positions at which the restriction enzyme EcoRI (E) cleaves the DNAs are indicated. Boxes indicate a herpes simplex virus thymidine kinase gene (HSVTK) and a DNA encoding neomycin/geneticin resistance (Neo). Long arrows above or below the boxes indicate the directions of transcription for lacZ and the neomycin resistance genes. The locations of genotyping primers I, II, and III are shown by short arrows above the gene schematics. (c) Poly(A)+ RNA was isolated from the livers of animals (n = 6) of the indicated Cyp8b1 genotype. Aliquots (15 μg) of total RNA were subjected to blot hybridization using radiolabeled probes derived from the coding region of Cyp8b1 and cyclophilin. The filter was exposed to x-ray film for 18 hours. The locations to which standards of known size migrated in the gel are indicated on the left of the autoradiogram.